29/9-We’ve learned new details about the ground assault on Alejandro Julianos’ estate that took place alongside the air assault over Monteddor City yesterday. While the majority of the city’s defense resources were engaged not only with the enemy aircraft, but several newly reported infantry incursions along the outskirts of the city as well, a small band of rebels infiltrated the estate. Leading the rebels was none other than the enigmatic Dougherty herself. The rebel leaders’ plan had been to initiate the city wide attack in order pull resources away from Julianos’ defense, and while the distraction certainly thinned the ranks gathered around the military commander’s compound, Dougherty apparently didn’t plan for Julianos’ personal guard. While Dougherty and her men are said to have made an admiral sprint for the estate’s main building, Julianos’ body guards were able to route the rebels into a small courtyard. Once inside, the body guards cut down the intruders with ease. To add insult to injury, Julianos wasn’t even present in the city, as his fleet prepares to aid in providing security for the Triumvirate Summit this week. Included among the dead is the rebel leader Dougherty, along with most of her best lieutenants and a platoon sized force of rebel fighters. Upon hearing of her death, the rest of the attacking forces surrendered. Those who laid down their arms were arrested; anyone else was promptly shot. The Monteddorian military believes that with Dougherty gone, the remnants of her farmer’s rebellion will be easily crushed as it descends into anarchy, an eventuality many intelligence analysts suggest was already on the verge of occurring. This impending collapse is likely the reason why Dougherty made such a large gamble in the first place. This would seem to be the end for Dougherty, leader of the Monteddorian rebellion. Or is it? Find out the truth in the first full-length Blackwood Empire novel, Where, No One Knows, available now on Kindle! 28/9- The skies above Monteddor’s capital erupted in a storm of flame and metal today, as the remaining number of Dragonfly Aircraft stolen by the rebel leader Dougherty attacked. Military commanders say that the fighters were targeting a number of Julianos warships stationed in Skydock above the city’s northern airbase. The attack came just after dawn, as the airships in question began loading up on munitions for their next deployment. The newly loaded munitions, stored on the top deck of the ship before being moved down below, offered an enticing target to the rebels. The stolen fighter planes managed to strike the payloads of two of the six warships, igniting the munitions and sending the ships crashing into the air yard below. One of the downed ships crushed a hangar where food and medical supplies were being stored. The rogue aircraft were about to engage a third ship, when a squadron of Monteddorian fighters from a base on the west side were scrambled and moved to engage. This squadron was none other than the elite “Flying Panthers” fighter squadron, a group of elite pilots assembled for the sole purpose of hunting the rebel planes. At the head of the formation was none other than Captain Anassia Degadas herself. Witnesses on the ground say that the fight between the Panthers, outnumbered two to one, and the rebel fighters was an astonishing sight to behold as the two groups swarmed around each other, trading shots and outmaneuvering one another until finally the Panthers were able to corral the attackers into a tightly packed, nearly wing to wing formation. Once this was accomplished, the fight was over in seconds. We are told that the Panthers did not engage in the same ‘playful’ behavior as their last encounter with the rebels, going instead for quick kills. Only two of the rebel fighters were able to break away from the fighting, but Degadas and her wingman gave pursuit and shot both planes down. In addition to the aerial attack on the air base, we are told that a small group of rebels engaged in a simultaneous attack on the personal compound of Alejandro Julianos. Details on this attack are scarce at the moment, but it is believed that all combatants were either captured or killed, and that they intended to target Julianos himself, who is said to have been in the city on personal business. More as it develops. 25/9- The second wave of Alejandro Julianos’ expeditionary force arrived in the colonies last week. Unlike the first wave, which landed in the Monteddorian colony of Sal Diello, the second wave headed directly over the mountains into the Deadlands. Citizens of Sal Diello claim that a small team of scientists from the first wave have set up a workspace in an old warehouse on the shore, which they report maintains a twenty four hour work cycle. They also say that ships come up the coast bi-weekly to drop off and pick up supplies and personnel. The Julianos scientists are said to come to town often for R&R, and while they have no qualms about mingling with the colony’s citizens, they are reticent about discussing their work. However, they tell us that one night a team member got deep into his cups and began describing an “impending event that will soon change the way the world works, that will rearrange the current structure of power and economic balance, and will completely change if not erase the current borders of the Empire.” Or something to that effect. Said staff member has not been seen in town since. In any case, Julianos’ interests in whatever lies south of the mountains and in the Deadlands remains a source of mystery and, for many, concern. This is the first report we have of an expedition entering the mysterious Deadlands and returning. Rumor has it that the Triumvirate Authority and ruling bodies of Crowndon, Nor Easter, and Monteddor are very concerned about what has been discovered. Even Monteddorian High King Mario Adallantes, who many believe to be nothing more than a puppet for Julianos, has been reported as suggesting the possibility of reigning Julianos in and demanding an explanation for his activities. As always, Alejandro Julianos himself could not be reached for comment, and even his spokesperson declined to make a statement, hinting very strongly that the Blackwood Gazette had been blacklisted by Julianos following our recent reports on the disappearance of Andoni Saldazar. 23/9– Author Pierre Fordeau, who recently published the memoir “Impossible Hearts in Forgotten Lands”, recently approached law enforcement in Sau Anoit to apply for protective custody. The petition is said to have stemmed from the arrival of a mysterious package found on his doorstep. In the report, Fordeau claims the package is meant to be a threat from the Pirate Queen Seylene Plamondon, but Inspector Donponte isn’t convinced. “The more likely scenario I think is the package came from one of his fans,” the inspector said. “You know how those sorts can be…they read something like Plamondon’s reaction to his book and they use it as an in-roads of sorts, to place themselves into the lives of the people they, for lack of a better word, ‘love’. No word on where Fordeau will be moved to (as is expected), or for how long. However, it is said that along with his application was a list of demands, including a new typewriter and ‘adequately luxurious furnishings’, as well as a constantly supplied bowl of Sweety Beets®, with the red ones removed. 21/9- Last month, the ongoing, globe spanning feud between pirate captain Roderick La Pierre and Pirate Hunter Johanna McKilroy came to a head, with the two stumbling across each other in a bar on the other side of the world and engaging in a fist fight that left both of them unable to walk. The fight ended with La Pierre issuing a challenge, for McKilroy to meet him in one month’s time over the skies where they first met. A month has since passed, and the Crowndon air corps has maintained increased patrols over the academy of aeronautical warfare. To date, neither La Pierre nor McKilroy has appeared. Many believed that the increased presence of the military had dissuaded the two from meeting for their duel, but we have since learned such isn’t the case. According to the citizens of a small town in the region known as The Middle of Nowhere, La Pierre’s ship the Pernicious Platitude spent a full week hovering in the skies over an old battle site from the beginning of the Crowndon/Nor Easter war. After a week had passed with no appearance by McKilroy, La Pierre left. Many assumed McKilroy had chickened out. However, it would appear this assumption is false as well. McKilroy’s ship, the Dismissive Smile, was seen some five hundred miles to the North East, over another battle site along the border between the Crowndon Empire and the region known as the Divide. She too, it is said, waited several days before leaving. So, which battle came first? 18/9- A disturbing new report from the Colonial Marshals suggests that everything leading up to current tensions between Triumvirate colonials and the native peoples of the Newlands has been a lie. Klaus Klaudhopper, a twenty two year old veteran of Crowndon’s Air Corps and ex-patriate from the nation of Rommsbach, was captured almost two weeks ago near a Marshals’ outpost fifty miles east of Fort Faulkner. Klaudhopper has several arrest warrants to his name, most notably for the murder of an Oligarch’s son in Rommsbach. 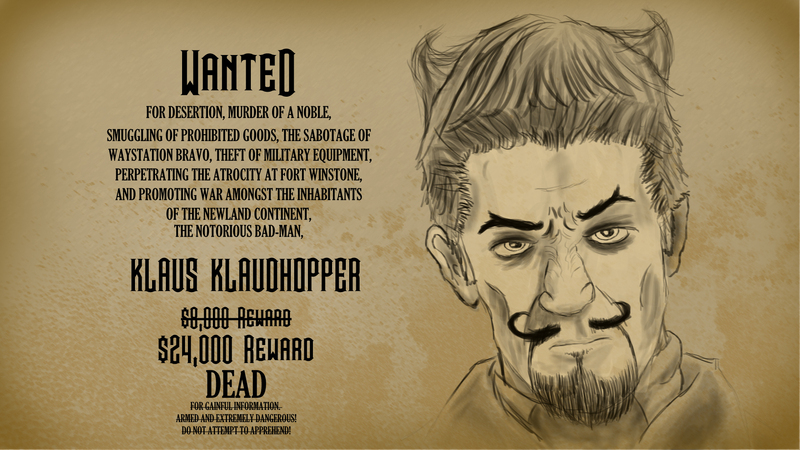 As reported last year by Adella Chatelaine, Klaudhopper was at some point being pursued by the Bandit leader Doctor Argyle Von Grimm. During his questioning, Marshals asked him about this incident. Klaudhopper revealed that he’d been pressed into working for Von Grimm for several jobs. One of these jobs was the theft of the dragonfly aircraft used against Marshal forces during the siege of Fort Winstone. Even more, Klaudhopper revealed that he was forced to pilot one of the planes, and that he in fact was the pilot of the plane that was discovered crashed along the Plasty Meridian in the spring. According to Klaudhopper, he’d been trying to escape, and the other pilot had shot him down. To add insult to injury, Klaudhopper claims that Von Grimm never crossed the Meridian, and that the Bandit leader’s plan had been instead to skirt along the southern border with the Deadlands, heading east toward the ocean and a waiting ship. If Klaudhopper’s testimony is true, then it would appear that the Colonial military forces’ attempts to gain entrance into the Territories has been for naught, and that the colonies’ current hostilities with the Territorial peoples’ is the result of a tragic mistake. As for Klaus Klaudhopper, it would seem that he will elude justice once again. He escaped shortly after his testimony was given, in a manner almost identical to that in which he escaped during a brief detainment last year. In both instances it is believed he was aided by an accomplice, a tall woman with dark hair known believed to be named ‘Arufina’. (Perhaps unrelated, but this description matches that of the mysterious rifle-woman seen during the Point Hammond shoot out. Point Hammond is a mere four day ride from Fort Faulkner). As a result, the already considerable bounty on his head has been increased three fold, for an identifiable dead body. Author’s note: A version of today’s image originally appeared in this post. I wanted to update it somewhat, to explore the idea of wanted posters as a form of propaganda, or perhaps convey the idea that some joker had come along and defaced an existing poster. 16/9-Nor Eastern agent provocateur Pixie Sinclaire continues to make waves in the Colonies, as she found herself involved with a stunning outbreak of violence in the town of Point Hammond earlier this week. Point Hammond was the last point of contact for the ill-fated Lelina Expedition, and Miss Sinclaire’s search led her to the town (which was ordered evacuated five months ago, though many citizens refused to leave). Miss Sinclaire is said to have been seen walking down the town’s main thoroughfare, asking for any information about the expedition amongst the town’s remaining citizens. Miss Sinclaire had just exited a local feed store when several shots rang out. Witnesses say that the shots were directed at Sinclaire. Another witness, a bar maid watching from the second story of the local saloon, saw what happened next. “The ginger wasn’t hit, I don’t think,” the bar maid, named Alice, said. “She didn’t panic either. Just dove right into a nearby alley, like it was the most natural thing in the world. I was terrified, myself, but I didn’t hide. I couldn’t stop watching. “After she ducked for cover, and the people on the street had scattered, a bunch of people dressed all in black rushed out into the street. They all had these weird guns I’d never seen the likes of before. “They went right for that alley the ginger ran into. They covered it with their guns. Of a sudden, I heard a BANG! In the alley. Things went deathly silent for a bit, and the guys in black, they all stopped. Then this body comes flying out of the alley, all dressed in black, like them. Then four more shots, BANG BANG BANG BANG! Come out of the alley, and four of the guys in the street fall down, clutching their legs and arms. That’s when the rest of them rushed the alley. “I thought the ginger might be done for, when more shots rang out. They were really loud, because they were coming from the roof right above my head. That’s when I looked up and saw this second woman with a rifle. Various reports from other witnesses offer only a sporadic view of events. Many don’t mention the second, unidentified woman with the rifle, though one unsubstantiated report claims that in addition to engaging the men in black uniforms, she also fired rounds at Miss Sinclaire whenever she deigned to emerge from the cover of the buildings. Eventually, it is said that Miss Sinclaire fled south, into the woods around the town, while the remaining men in black uniforms fled north on horseback, but not before collecting their wounded and dead. At least one report claims that Sinclaire appeared to be clutching her side. A nearby platoon of Colonial Marshals searched for the group, but found no trace of them, nor of the rifle-woman, nor of Pixie Sinclaire.